I've been an absent blogger this week. My daughter and I went to visit my husband for a couple of days. We visited a college, saw where Paul is working and living, met with a realtor and got the whirlwind tour. I feel like I have run a marathon. It is good to be home. Today before we left, we looked at an 1880 Colonial with a barn and tiny cookhouse out in the middle of the countryside. The only evidence of life were the hundreds of deer prints and the many birds that greeted us. I think this one may need too much work even for me, but boy was it a beauty. What would a post be without a fabric picture? I cut this pile of goodness on New Year's Day when I was home by myself all day and night. It just about took that long too. With the exception of the grey floral print (which is from the "Old New Collection" and the white floral and pink polka dot - all fabric is "Hill Farm" by Brenda Riddle for Lecien. Brenda's blog is here. The fabric is just gorgeous. I can't wait to show you what I'm doing with it. Have a great weekend! OLA GRACE,ESSES TECIDOS ME INSPIRAM MUITO,SÃO BONITOS.GOSTEI DO BLOG DA BRENDA TAMBÉM,CHEIO DE TECIDINHOS CUTE,RSRS.BOM FIM DE SEMANA.BEIJOS.VALÉRIA. This is such a sweet fabric line and I love every one of Brenda's. She is a sweet lady too! Good luck with your house hunting. Are you staying in Michigan? Sounds like you had a wonderful 1/1/13 - playing with fabric!! These fabrics are beautiful, the colors and patterns are wonderful. House hunting can be exhausting yet exciting too. Enjoy the adventure. I am on the edge of my seat waiting to see what you are making! I love that fabric group! Lovely fabric. Glad you got some ti,e with your husband, even if the trip did leave you exhausted. Our Heavenly Father has the perfect place for you and His timing will be perfect. That house in the country sounds great. Hope you all find the perfect home soon. Pretty fabrics. House hunting -whew. I am praying for you on that topic. These fabrics are so you Renee! I just love the pretty colors and prints. Thanks for the link to Brenda's blog, it is new to me. I can't wait to see what you make with your pretty pieces. Happy house hunting! That's a whole lot of cutting out - well done! The fabric is so lovely, I look forward to seeing what you create. Have a happy weekend! Such a pretty lot of fabric! 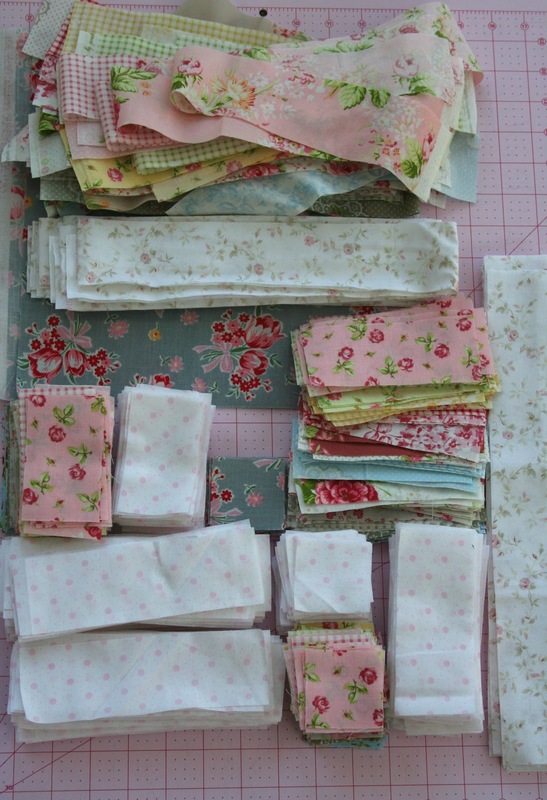 That fabric is lovely, I will look forward to see what you make with it, so pretty. The old house you saw sounds so lovely. I dream of living in a place like that one day though I'm useless with fixer upper stuff! Love the beautiful fabric. Can't wait to see what you make.